O’Brien TRACEPAK, STACKPAK tubing bundles are insulated tubing systems that provide transport and conditioning for analyzer systems. VIPAK instrument enclosures, SADDLEPAK modular instrument supports and FLEXPAK insulated flexible instrument covers protect the instrument loop. 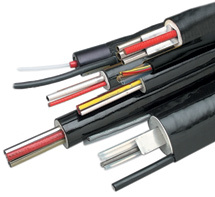 TRACEPAK S-Line tubing bundles provide insulated tubing for steam supply and condensate systems. O’Brien also provides design optimization, applications engineering, and factory installation services.